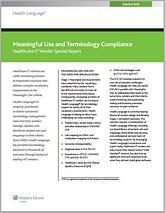 Are you under increasing pressure to meet the Meaningful Use criteria? In order to do so, you’ll need to implement solutions that address complex vocabulary requirements. To download this white paper, please fill out the form to the right.